The sensations I’ve experienced as a tandem surfer are among the most exhilarating and exciting of all the activities I’ve ever tried. Anadrenaline junkie at heart, I’ve been known to travel to exotic locations and go skydiving and paragliding, scuba diving and hike volcanoes — always seeking any kind of adventure possible. Spending time in nature is so important to me, because I always feel recharged and energized. Despite my busy schedule as a yoga teacher, writer and model, I’m still committed to making time for the great outdoors. Finding an outlet like tandem surfing created a fusion of my love for yoga, the ocean, adventure and travel. I’m always smiling when I’m out there in the water.Tandem surfing has captured my heart — there’s nothing quite like flying down a wave, being held in the air upside down and feeling the wind and ocean spray on my face while simultaneously staying focused both physically and mentally. Many of the lifts involved in tandem surfing require you to stay strong through your core, while engaging the arms and legs and relaxed through your heart, chest and shoulders. 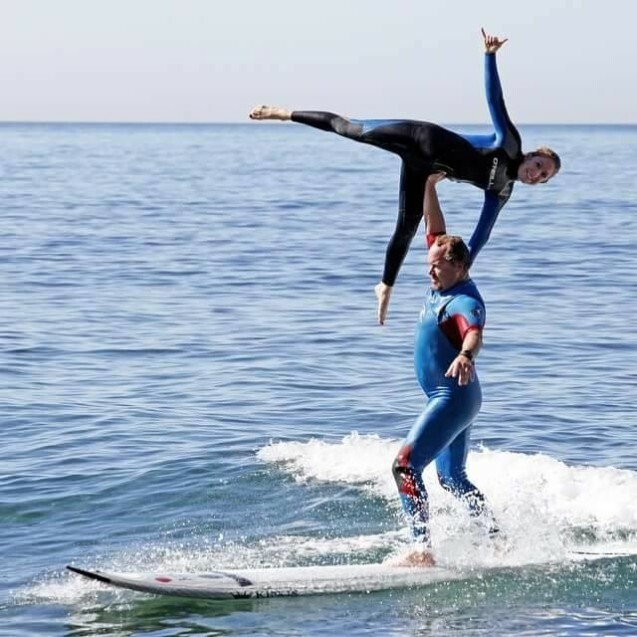 Similar to a regular yoga practice, tandem surfing requires balance, focus, strength and flexibility. But above all, you’ve got to have a sense of adventure and fearlessness! The ocean is so powerful and dynamic — every wave is unique from the last. Here are three reasons why I love tandem surfing. I hope this inspires you to give it a try — just be sure to find a partner you can trust and take some lessons from a certified instructor first! 1. Tandem requires fearlessness and trust in your partner. Together you’re a team and must establish trust in each other. My teammate and I lay belly down on the board and paddle out, choose when to go for a wave, paddle together with our arms to catch the wave, and stand up in unison. We “drop in” (catch the wave and ride down its face), “bottom turn” (go left or right depending on the direction the wave is breaking), and then I get hoisted up into the air in a variety of lifts that can be done one at a time or sequenced together. Practicing tandem surfing has been an amazing avenue to build trust in many facets of my life. There’s an art in the sport that revolves around strength coupled with softness, engaging some muscles and relaxing others, motivation and drive to catch a wave and surrender to the current of the ocean. Trusting the process, in each other and especially yourself, is paramount. 2. Tandem surfing builds patience, balance and strength. In this sport we rely heavily on our ability to submit to the power of nature, the ocean, and the energy force behind a swell. When a “big set” (series of waves) comes through and you’re stuck inside the impact zone (where the waves are breaking) trying to paddle out, you have to be calm, strong and focused to push through the wave. My partner Travis has the leash around his ankle, but I’m not attached to anything. There have been times when I’ve had to swim away from the board and underneath huge waves. This used to make me nervous, but I’ve learned how to remain calm and relaxed, surrendering to the force of the waves. I know that by remaining patient, I will eventually resurface and catch a breath. There are times when we’re waiting for what seems like forever, for a set wave to come. Waiting for the right conditions requires a ton of patience. Maintaining the right balance between power and strength, or softness and surrender, are great lessons involved in tandem surfing. 3. Tandem lifts give you a rush of adrenaline like no other. One of the highlights of tandem surfing for me is how well-received and excited people get when they see us in action. I always have a smile on my face when I’m out in the water. I feel so in touch with nature and get to enjoy the beauty of it all around me. To me, exercising and moving my body in ways that feel great, and providing some joy and excitement for those who witness our session is what makes the sport even more magical for me. I don’t surf for anyone but myself and my teammate, but to know that it’s entertaining for others to watch just feels really good! I’ve gotten to know many amazing people through participating in and pursuing this sport. You never know how much a smile or a “shaka” (a well-known hand gesture among surfers) while soaring down a wave, can positively affect someone else’s day. Whenever Travis and I perform “Sidebird” (pictured here), I know we’re uplifting our community and spectators and bringing a smile to their faces, too. Connecting with others and impacting lives in a positive way is my mission in life, and being a part of the tandem surfing community only adds to that joy for me.